Daily Slideshow: What if you went back in time, and brought everything you know now with you. 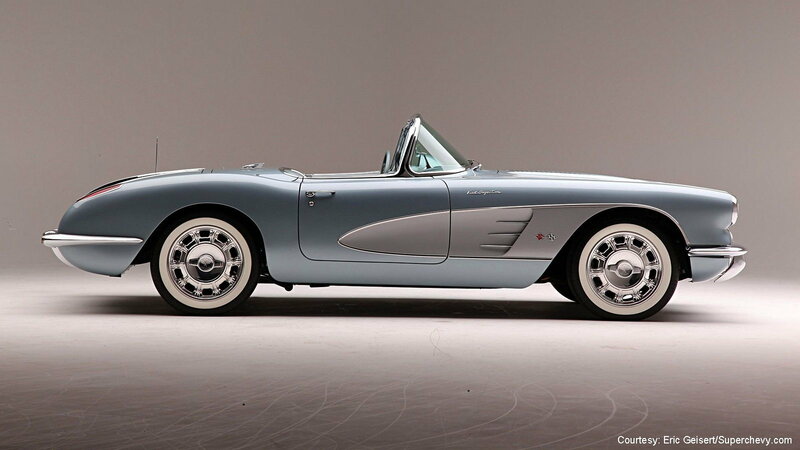 One man kind of did that, with a 1958 Corvette, updated to modern performance. People say there are no second chances in life but don't tell that to Bob Matranga, owner of the 1958 Corvette we have here. You see, Bob had a '58 Vette in his youth but he let it slip away. That car may have gone away, but the memory of its lines hadn't, and when Barrett-Jackson Las Vegas 2017 came around Bob was ready to take back a piece of his past. As David Lee Roth once said, "Money doesn't buy happiness, but it buys a yacht big enough to sail right up next to it." 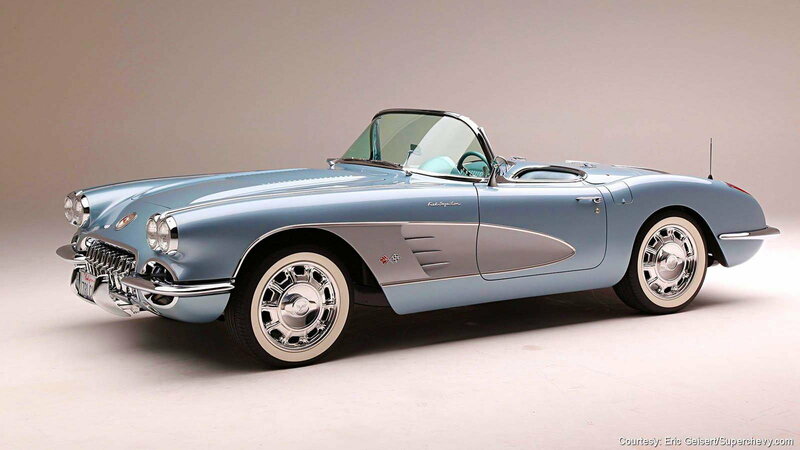 Well, in this case, it bought another 1958 Corvette. 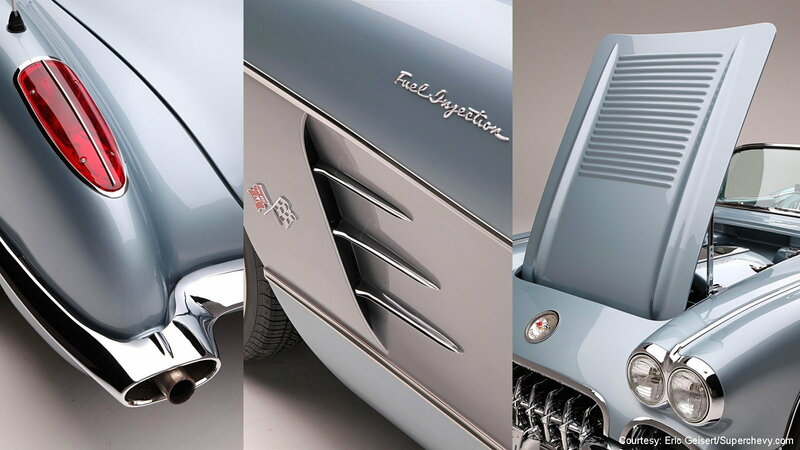 From the Barrett-Jackson catalog: “Lot #1288... was conceived to closely preserve its stock appearance while incorporating a host of performance, handling and comfort enhancements.” Bob Matranga won the lot, and with it the work of a man named Greg Thurmond, from California's GTS Customs. Greg Thurmond learned his trade in his dad’s custom upholstery shop as a youth and now his shop does it all, from engine and suspension mods, to paint, body and interior work. 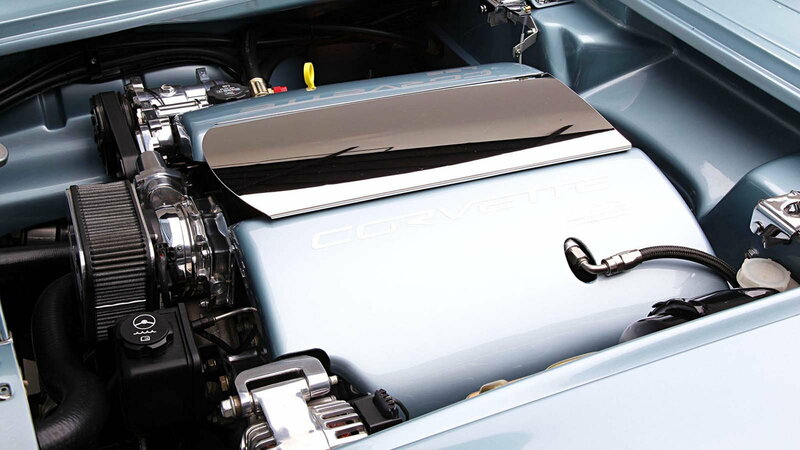 >>Join the conversation about Blast From the Past With LS2 Power right here in the Corvette Forum! He explains: “My dad was always building and painting something in our garage as I was growing up. I learned to paint at an early age, as well as turn wrenches." 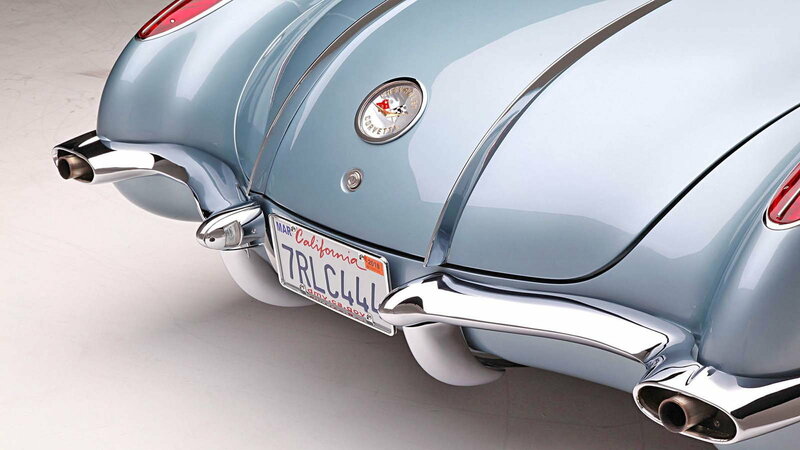 He also learned to love Corvettes, and the attention to detail he put into this car is visible from every angle. GTS Customs used an original 1958 Corvette as the base for this project, then took it from there and ran with it. 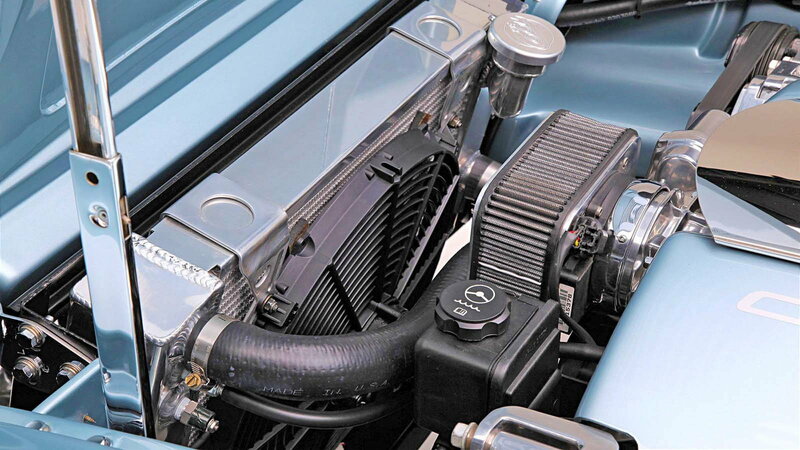 Newman Car Creations modernized the original C1 chassis by installing modified C4 independent rear suspension, which GTS Customs further tweaked with a cantilever shock set-up of their own design. The forged aluminum front suspension is also sourced from a C4 Vette, as are the vented disc brakes at all four corners. If you look closely you might be able to tell that the Federal 225/55-17 whitewalls ride on billet rims with a faux hubcap design, courtesy of EVOD Wheels. To fit all of that C4 handling goodness under the classic '58 body Outrageous added a set of GTS Customs' own 1.5 inch wider rear quarter panels before the car went to their paint department, which goes by the name 'Outrageous Paint by GTS Customs'. When the time came for paint, Greg from GTS started with a BASF grey resin sealer before applying the BASF Diamont light metallic blue body, and silver cove, colors. 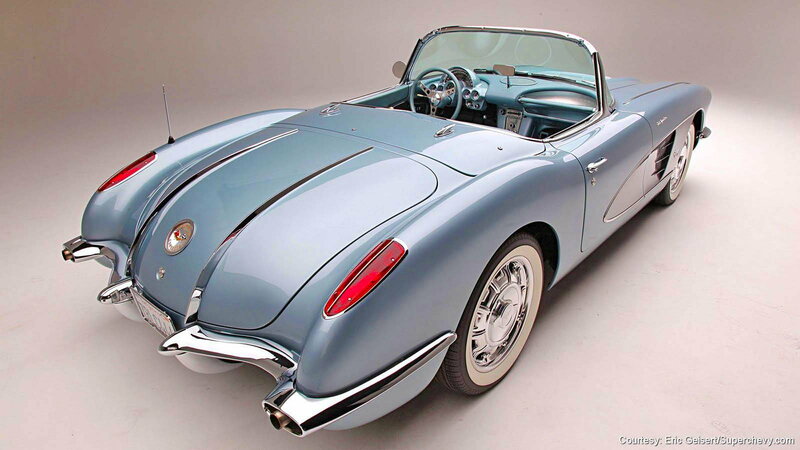 The BASF colors are based on Silver Blue body and Inca Silver cove colors original to 1958 Corvettes. The effect is sufficiently retro while at the same time being tastefully modern. Where Thurmond's experience with upholstery really had a chance to shine was in the interior of this gem. 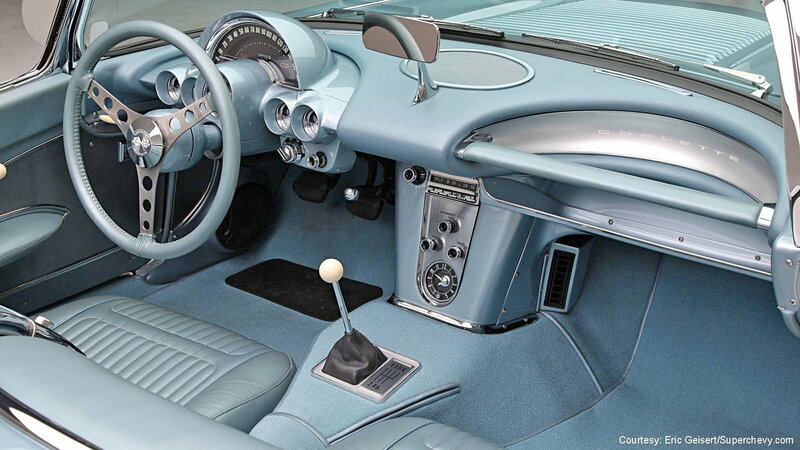 Blue/gray was chosen for the interior, over the other factory option for a Silver Blue car in 1958: charcoal. We completely agree with their choice. 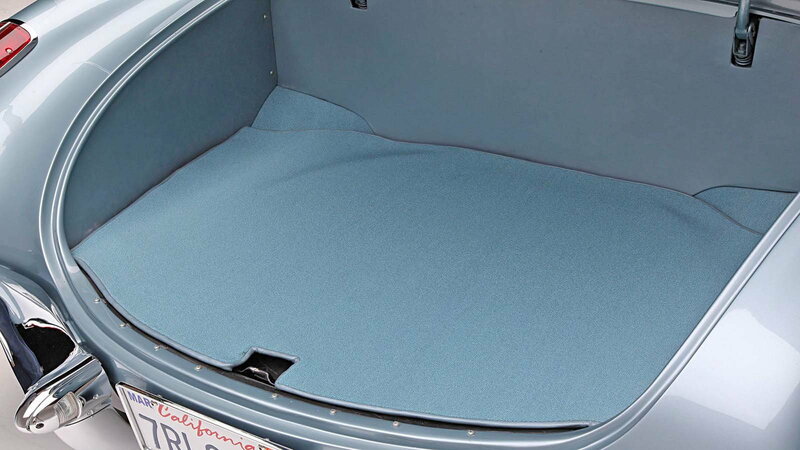 It's also hard not to agree with the choice of a period-looking custom interior fashioned with hand-made bucket seats wrapped in soft leather, rather than a stock, vinyl option. 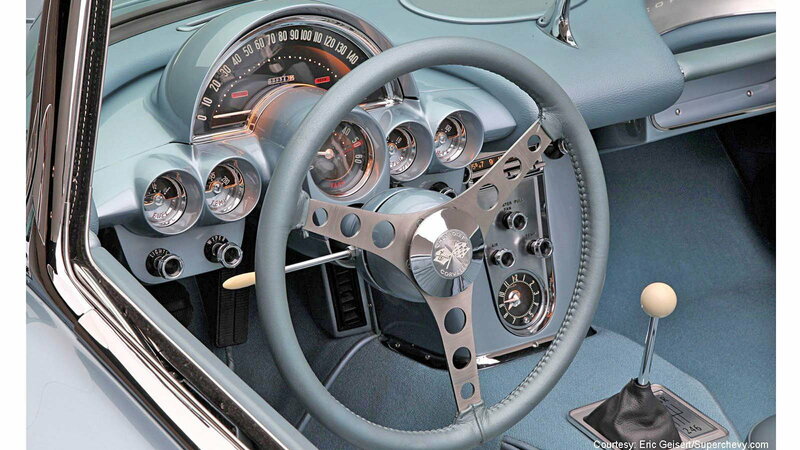 The steering wheel may look original at first glance but it's actually a smaller, more functional copy of a '58 wheel. Owner Bob Matranga's hands will thank him as he grips it and looks out over the one-year-only washboard hood. A lot is made of Italian hypercar maker Pagani's Huayra's intricate interior details and hand-crafted style, but not only does a Huayra have nothing on a 58 Vette, but it was also quite possibly inspired by it. Certainly, no 1958 BMW or Mercedes had this level of industrial design magic going on inside it. GTS Customs took pains to restore the original gauges and radio to the same level as the rest of the car, and it shows. The quality of this work is nothing short of flawless and current owner Bob Matranga recognizes it. Out of his collection of more than 50 cars, he says this Corvette is the best engineered and executed vehicle he owns. Maybe you can't go back in time, but sometimes you can drive right up next to it in a resto-mod Corvette. For more pictures and information, check out his feature in Super Chevy.